With this review we thought we’d do something a bit different. Rather than spewing raw stats and opinions from a single point of view, for this one we’re giving you TWO mouth pieces! 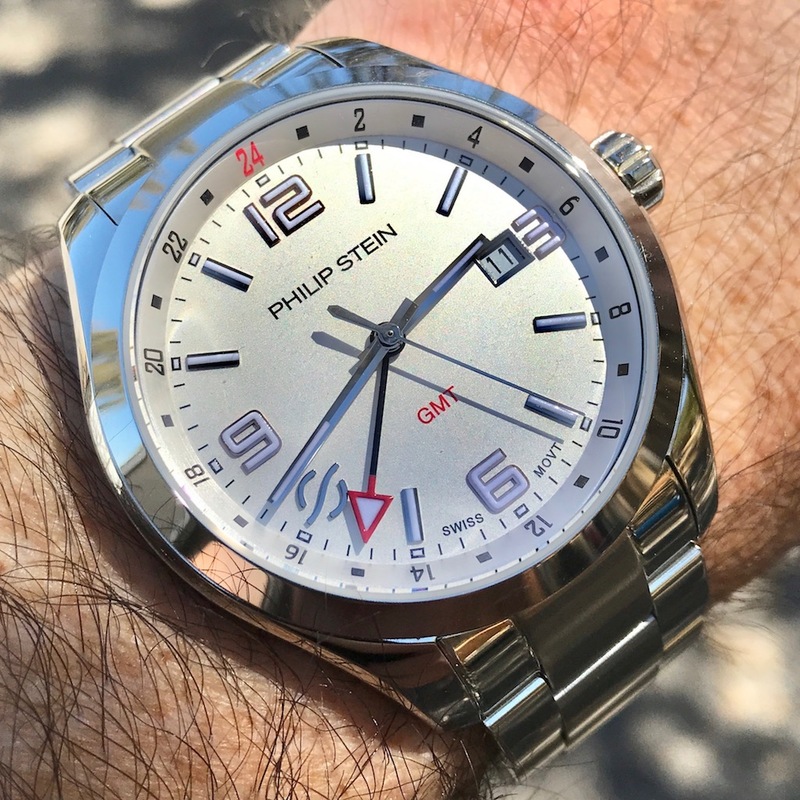 After a month of wearing and evaluating a couple of pieces from Philip Stein, Perpetual Girl and I had a conversation about them, sharing our thoughts and observations about these very unique watches, and then putting pen to paper (or finger to keyboard as it were) to share those thoughts and observations with you. Before we dig into the guts of this one, first a quick background on Philip Stein. Founded in 2003 as a wellness lifestyle company, Philip Stein began making bracelets and watches that contained their own proprietary technology with the ability to collect Schumann frequencies (named after the German who first discovered them in 1952) and transfer them to the human body. These frequencies, under 40hz and created by natural phenomena such as lightning strikes, are said to help one’s mood and feeling of well being. The bracelets are designed to help an individual sleep, while the technology embedded in the back of the watches is designed to increase alertness, improve balance and ocular focus, and even reduce that lightheaded effect you get when you stand up too quickly! According to the few studies that have been done on these Schumann Resonances, the effects from individual to individual vary greatly. Some wearers report almost immediate and significantly noticeable effects, while others feel little or nothing. Ok, let’s get to the watches! Ranch Racer: So I’ve got the Men’s Traveler white dial GMT. My initial impression is that it’s a very well made watch. The three-link bracelet has solid end links, and something that I’ve personally never seen before, two quick release buttons on the underside of the end links to easily remove the bracelet. My first thought is that it’s a very cool feature since you don’t have to futz around with a spring bar tool, possibly scratching up the underside of the lugs in the process. However, once you’ve removed the bracelet you now have no spring bars in order to say, thread a NATO strap or mount a standard leather strap. The way it’s setup now, the only types of straps that will work are ones that have an integrated quick release spring bar, unless of course you go in search of aftermarket spring bars that will fit these lugs. Most owners of this watch probably won’t want to bother with that. In any case, the bracelet, with polished edge links and brushed center links, is quite nice. I actually received quite a few compliments on the watch in the month I wore it. 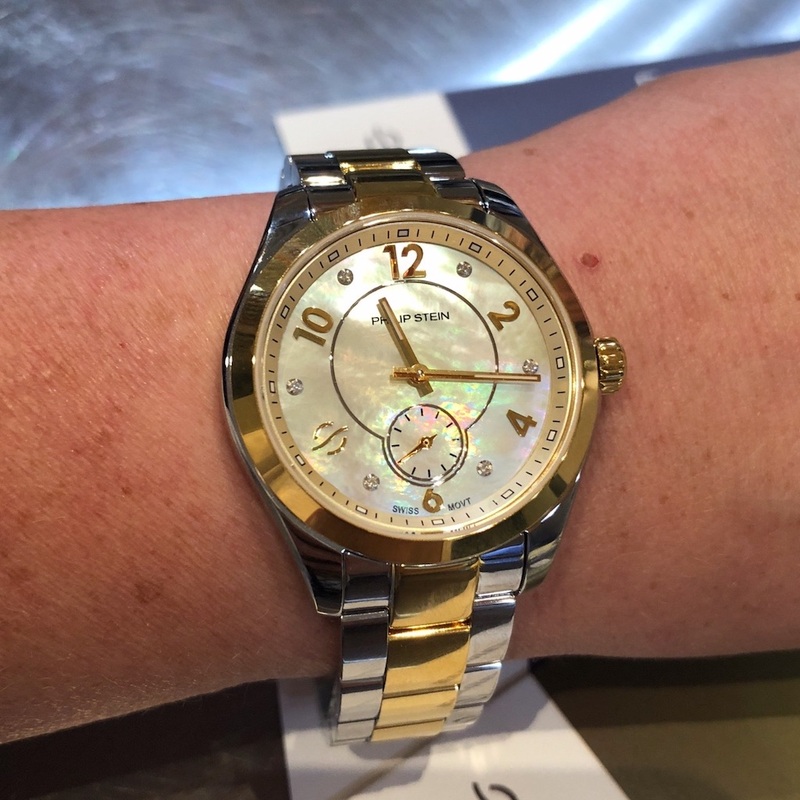 Perpetual Girl: I have the Ladies Traveler with sub-seconds dial. This one is fully polished. No brushed surfaces here! 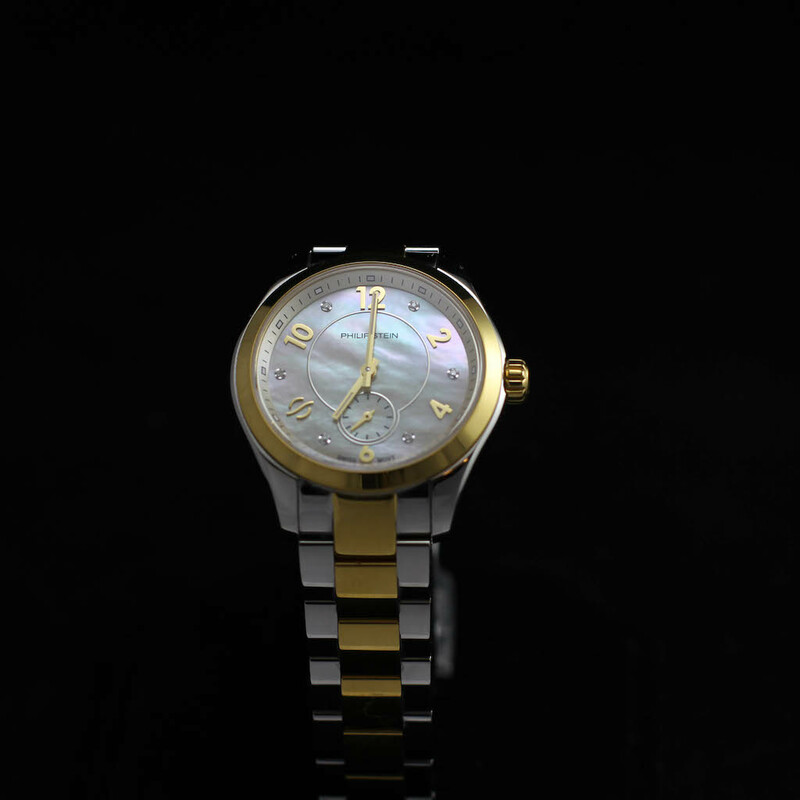 It’s a very classic design with the two-tone case and bracelet and a gorgeous mother of pearl dial in light colored shades. It’s actually one of the nicest MOP dials I’ve come across. The watch feels substantial, with a good weight to it. I’m pleasantly surprised. It also has the quick release bracelet end links, and as someone who doesn’t spend every waking hour with a spring bar tool I really like it! RR: So let’s talk about dials. 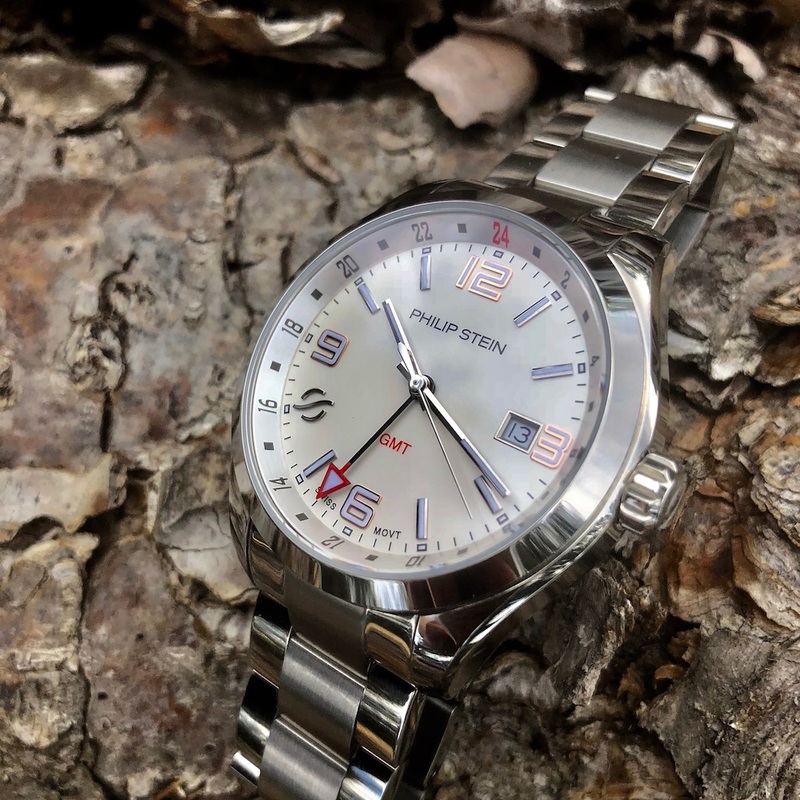 The dial on the Men’s GMT is white with polished and applied indices. 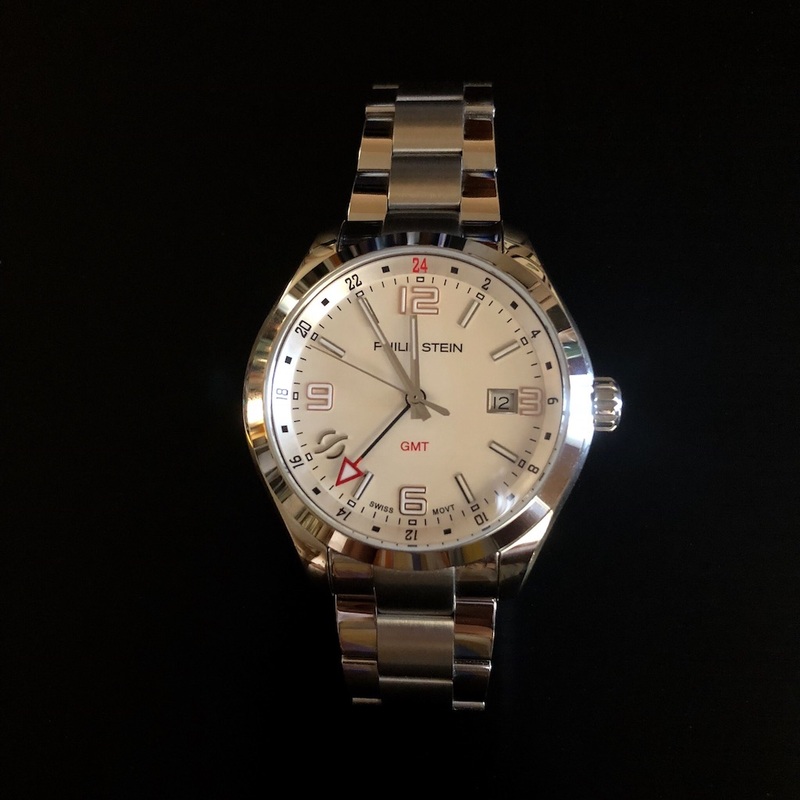 The indices at 3, 6, 9 and 12 are white Arabic numerals with a thin red outline, which really ties in nicely with the red “24” on the rehaut GMT scale, the “GMT” text above 6 o’clock, and the tip of the GMT hand, also white with a red outline. These little splashes of red really help bring the whole design together. I like it a lot. The indices are all lumed so it looks pretty cool at night, though I did notice that the lume doesn’t last long. The 8 o’clock index has actually been replaced with the Philip Stein logo. This is an interesting choice and honestly I’m not sure how I feel about it. I think the dial might be better balanced with the logo under 12 o’clock with the “Philip Stein” text, or down below dial center with the “GMT” text. A minor gripe, I know. It’s the whole Christopher Ward logo at 9 o’clock argument all over again! PG: I actually really like the logo at 8 o’clock on this one. Having it in one of the more traditional locations would cover up this beautiful MOP dial, and I think having just the “Philip Stein” text makes for a very humble and clean dial. It works for me, and it’s slightly sporty but still dressy enough for a night out. The diamonds at the odd-numbered index locations are stunning and really sparkle. RR: On the men’s dial the date window is done nicely. It’s in the traditional 3 o’clock location, but they’ve done a good job at having it not intrude on the “3” too much. I’m always a big fan of a finished date window, and this one’s nicely finished with a polished bezel surrounding it. I definitely give this dial a thumbs-up. PG: I’m a big lume fan, and the one downside to this piece is that the lume is not long lasting. While my Seikos last all night, the lume on this one wasn’t visible after a few hours so it’s not a watch I would wear to bed. But I can’t say enough about this MOP dial. They have other MOP dials, including one in blue, but this one is definitely my favorite. I tried it on in Vegas and specifically requested it for this review. I would love to have something like this in my personal collection. RR: Moving on to the case, they’re both pretty basic, classical designs. PG: Kind of reminds me of my Rolex Oyster Perpetual case. RR: Yeah for sure. On the men’s the lugs are polished while the case sides are brushed. The thin, 45 degree polished bezel is nice and allows for a lot of dial real estate. Where these really get unique are on the case back, which has a small round window revealing the special technology. It looks to me to be a copper disc with the Philip Stein logo, but they don’t reveal their proprietary technology or how it works. Copper would make sense since bracelets made of the material have been touted for years as providing health benefits to the wearer. It might also contribute to the weight of the watch. PG: It could, but when I hold the case in one hand and lift the bracelet with the other, it feels substantial. It’s not a cheap bracelet, so I think there’s more to the weight than just the added technology. RR: Agreed. They’re definitely not cheaply made pieces. As far as the bracelet on this one, the end links are custom made with those quick release buttons that you push in towards the center of the bracelet to release it from the lugs. It’s really a cool feature, especially for those who don’t own a bracelet changing tool. I’ve never seen it on any other metal bracelet. I applaud Philip Stein for their original thinking here. The clasp on this one is of the butterfly style, and generally I’m not a fan of this type of clasp, only because it’s easy to cheap out and not have the ends line up perfectly once it’s on your wrist. That’s not the case here. The ends meet up perfectly and it achieves the effect of looking like a solid bracelet all the way around, so it’s executed well. PG: I love butterfly clasps, and this one is super easy to use. Both sides release with a single press of the buttons on either side of the bracelet. It’s not like some others that I’ve worn or own where you need to fasten one side before the other, or stick your finger between the clasp and the bracelet to release it. It’s really effortless to fasten and unfasten, and it looks great. 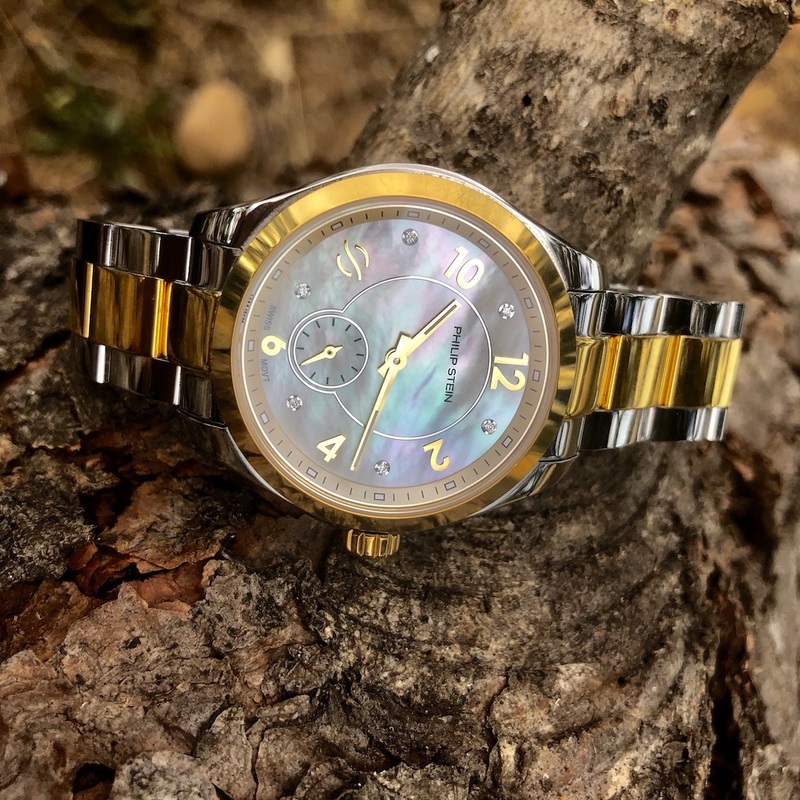 The two-tone on this watch is beautiful, and it really adds to the sparkle on this piece. RR: So moving on to the movements and functionality, they’re both quartz, which is not necessarily our first choice most of the time. Something I always look closely at is how well the seconds hand lines up with the indices on each tick. In this case it’s spot on, so well done there. 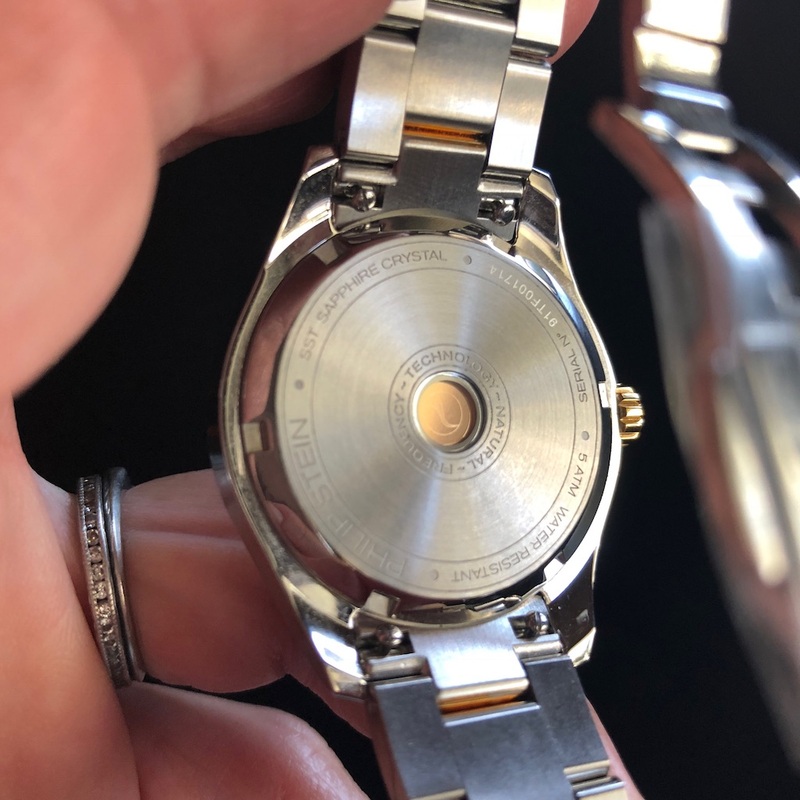 PG: It’s even harder on a tiny sub-dial like the one on this women’s version, but this one has perfect alignment as well. RR: The movement in this GMT is a Rhonda 515.24H. Honestly I’m not a fan and I’ll tell you why. When you adjust the GMT hand it doesn’t jump in 1-hour increments. It’s infinitely adjustable, which means that in order to have it accurately stay in sync with the main hour hand you need to set it on the hour. I’ve got another quartz GMT watch and it works the same way, so I’m guessing it’s just a function of how any quartz GMT works. If I were to add a Philip Stein Traveler to the collection, it would be one of the standard 3-handers and not the GMT. PG: They have so many different styles and collections that you’re not just limited to the Traveler collection either. There’s really something for everyone. They even have an automatic. RR: They do have an automatic, but it’s pretty pricey. I believe it’s over $1,000. PG: I believe the movement in the women’s Traveler is a Rhonda 1069. There’s no date on this one and it’s got the sub-seconds dial. I really like the look of this watch, but would definitely prefer an automatic movement, especially at this price point. The sub-dial is easy to see and the main dial is very readable. I don’t need my glasses to read the time! The crown is gold and signed with their logo. I’d like to talk a bit about the health and well being technology piece of the watch. I tried wearing this watch as often as I possibly could because they recommend a minimum of 30 days to really benefit from it. 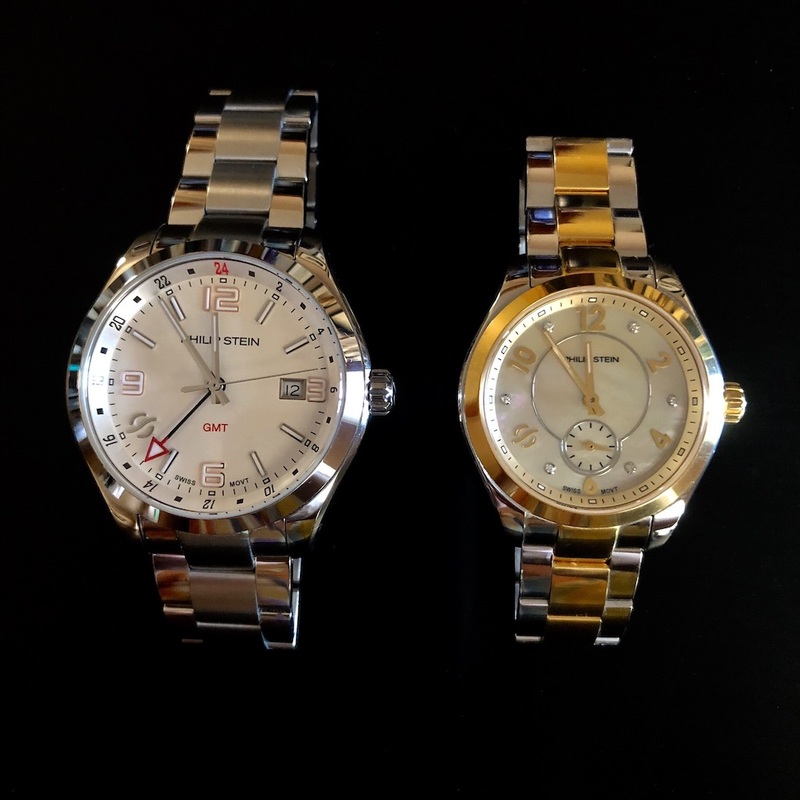 That’s so hard for us since we’re always reviewing watches, plus we have a large personal collection. At the end of the day I don’t feel that I really had enough time to really see the benefits. I think this would need to be owned and worn by someone who doesn’t have a large collection. 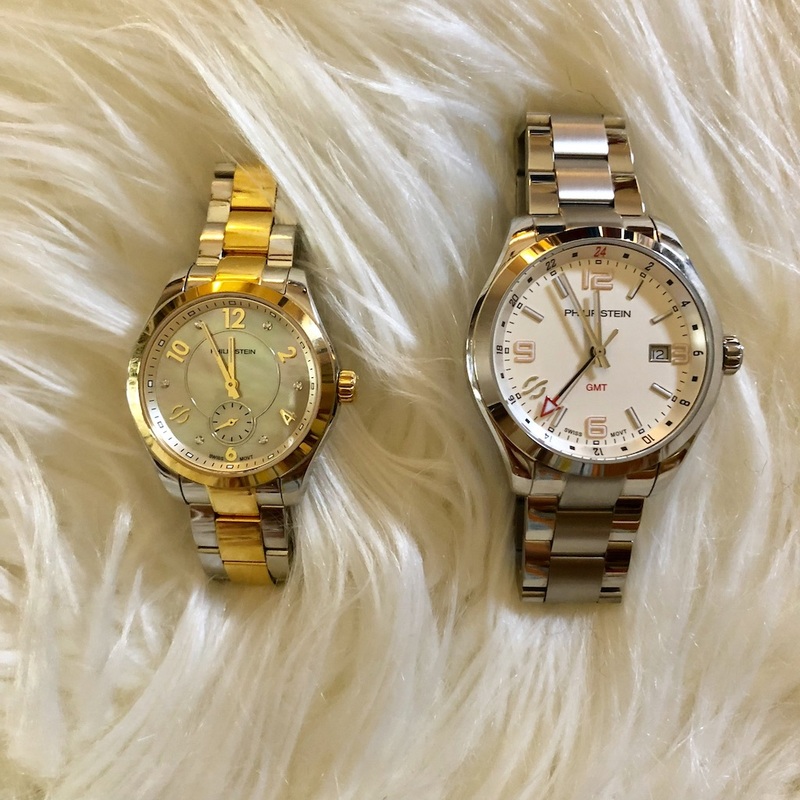 Basically it would need to be someone’s only watch that they wear every day, and if I weren’t a watch collector and blogger, I would definitely give it a try for a longer term, especially given my autoimmune disease. Anything that helps me feel better is a good thing! I think they make a day bracelet with the same technology that’s in the watches, so I might buy one and give it a try. RR: I would agree. I just didn’t have the opportunity to wear the watch often enough to really test out whether the technology had any effect on how I feel. I suffer from migraines and didn’t see any noticeable difference in the amount or intensity of those. As a watch blogger I was reviewing the piece simply on its merits as a watch. I guess the real question is, would we buy these watches? As I said, I wouldn’t buy this particular GMT version because I just don’t like the movement. I would possibly consider one of the three handers but something we haven’t mentioned yet is price, and in this case that might be a stumbling block for me. At $595 this particular piece would be a tough sell for me. That’s a good chunk of change for a basic three-handed quartz watch. I certainly understand that the technology likely adds to the cost here, and so for someone that wants a really nice looking watch that could also potentially improve their health and well being, this could be an excellent choice. In this price bracket there are too many other solid choices, many with mechanical movements from the likes of Seiko, Citizen, the hundreds of micro brands out there, and even a few of the Swiss brands. I’m clearly not the target market for this watch, but that doesn’t mean it wouldn’t be a great choice for someone else. It’s just not for me. PG: I would buy this watch. First, I love the look. And second, if you look at the cost of one of the bracelets and then extrapolate the potential cost of the technology, the pricing is close to where it should be. It’s in line with other higher end quartz pieces from larger manufacturers. As a watch geek, I do wish it had a mechanical movement, but as someone with health problems who simply enjoys wearing a watch everyday, I could see myself owning this. Would the author personally buy and wear? Ranch Racer probably not. Perpetual Girl, DEFINITELY!